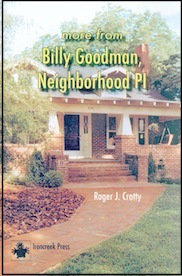 Billy Goodman was first introduced in Billy Goodman, Neighborhood PI. Billy, owner of Goodman Investigations, is a guy who never left the old neighborhood. He sees it changing, knows it’s not the place where he grew up anymore, but he won’t ever leave. He has great loyalty to the city where he lives- the city, not the suburbs. His company is a one-person firm with an office on the fourth floor of a once grand building in his city. His main business comes from doing work and favors for people who still live in the city, in the old neighborhood- or people who used to live there. He is not a tough guy physically, nor is he quick to pull a gun, or the trigger. Loyalty and integrity are what he is about, and why he is, in fact, tough and strong. On these pages you’ll read more about Billy, his firm, his cases, his friends, his neighborhood. Let him tell you all about it.